8 entries categorized "WESTERN REGION"
We received a couple of e-mails today from Chris Rowse, who`s grandfather worked at ARC Judkins. Dear Editors, I came across your site whilst researching info on Euclid/Terex trucks and Judkins quarry at Nuneaton. I'm hoping that through your column I may be able to get in touch with some of BH's former employees or other readers of the BH memories site who might have any reminices, info or photo's etc of the quarry in the 1970's. My late grandfather, Bill, worked at Judkins for a number of years in the early 70's. He was the quarry's utility man (i.e. dogsbody!) and basically filled in wherever needed to cover for holidays, sickness etc. 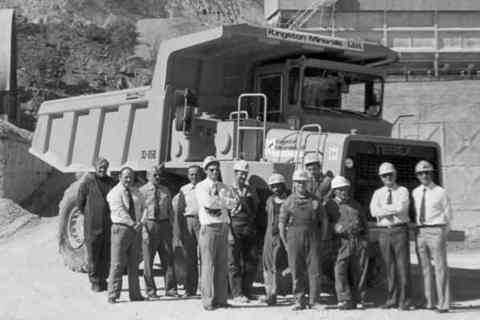 As such he operated various machinery around the quarry, including the five Terex trucks the quarry had at that time (four R-25's and an R-45) which were supplied by Blackwood Hodge. At the time I was only 10-14 yrs old, but he used to take me to work with him on occasional saturdays, when I would ride up & down all day in the "Eucs", either with him or one of the other guys (somehow I don't think this would be allowed today!!). I don't remember very much about the trucks, other than the R-25's were numbered 1-4 and were fitted with standard bodies. No.1, I think, must have been a slightly earlier model than the other three as it had the long external steering shaft from the cab down to the front bumper, but other than that they were all similar & I think they all had Cummins engines. The R-45 I think had an air-start V-16 Detroit motor & Allison semi-auto transmission (gear selection was through a staggered 'gate' shift). None of them had a second seat, so it was a case of using an old cushion and try & get as comfortable as you could! 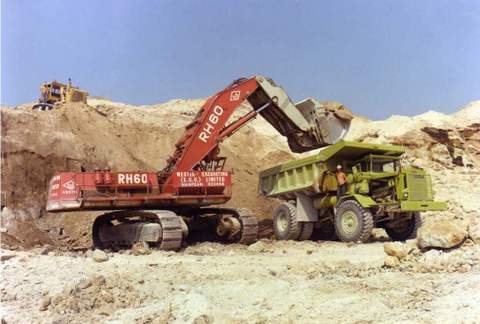 At that time the quarry was using an RB-71 and a Broyt (can't remember which model, maybe an X-4??) for loading, although I seem to remember the Broyt spending quite a bit of time out of action for various repairs, when a Michigan 175B was used to fill in until it was fixed. Being young at the time, I didn't take any photo's at all, but I would be very keen to hear from any readers of the column who may have any photo's they'd be happy to share, or more info on the quarry from around this time. Yes, that's fine - please do post the message on the website. I think you're right about the R-45 being supplied by HML; as far as I remember, it was always in ARC corporate colours (dirty brown) - any idea when it was delivered to the quarry?? It was only the R-25's that had the "Supplied by Blackwood Hodge" stickers on the side of the body & they were all Terex green. Judkins sold the quarry to ARC, as far as I know, around 1970-'71, so I think perhaps the R-25's would have been purchased by Judkins, from BH, and the R-45, as you say, by ARC from HML. We do have a late Albert Finch in the family, although I'm pretty sure that it's not the Albert Finch who was QM at Judkins. As far as I know, the only relatives of mine to work there apart from my Grandad were Wilf Booton (Transport Manager) & his son Howard. Perhaps the other quarry you remember beginning with 'B' is Boons, which I believe Judkins bought out. HAL`S EMPIRE GETS A NEW CAPITAL. 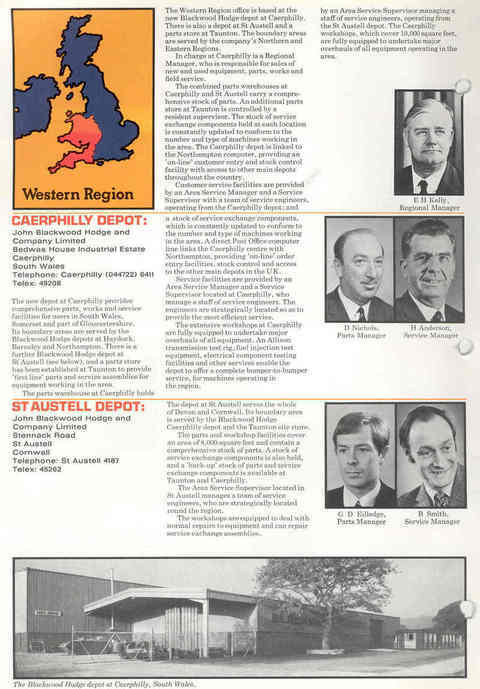 OCTOBER 1972 SAW THE OPENING OF THE NEW PURPOSE BUILT JBH DEPOT AT CAERPHILLY, WHICH BECAME THE PRINCIPAL DEPOT IN WESTERN REGION, UNDER THE DIRECTORSHIP OF HAL KELLY. The Service Manager for Western Region at that time was Harry Anderson, and his son David who now works with Martin Ede, has come up with some interesting items, amongst which is a copy of the double page article & adverts covering the opening on October 1972. The article was in the Western Mail, and has a byline by Hal, and no doubt typed up by Carol Lowe. We have had to split the pages into three to scan, due to its size, but hopefully you will make sense of it. In addition to the newspaper article, we also have three photographs, one which obviously relates to Western Region, but the other two we are not so sure of, as they both feature Harry, but also a number of what we assume are Euc/Terex types, some of whom we know, others we dont, so if there is anybody who can identify any of the "unknowns" shown, we will be grateful to hear their ideas. In the meantime we shall leave them in this section, till we find out where they go. Nearly a full house, l-r Doug Nicholls, Harry Anderson, Hal Kelly & ???? ???? ?, ITS KEITH ARCHBOLD OF COURSE, with Roger Betts about to give them all a surprise with the bucket teeth !! We think we have Dave Gebbie, Unknown, Unknown, Doug Beech, Unknown, Harry, & Dave Cook. Bob Craigie thinks that is probably at Newhouse, and that the 2nd & 3rd left are Newhouse training staff, but he cant help with their identities. Easier to name the ones we do know here, with 1st left Bill Watson, Terex Service Dept, Harry is 3rd left, and Dave Cook far right...the other four are a minor mystery, hopefully solved by you diligent viewers !! Frank Woodward did it all in his area of Western Region for JBH, but we have very little about him on the site, so even this very small item is more than welcome. It came from Roger Betts, demonstration driver during the 1960`s & early 1970`s, and comes from a page of Contract Journal, June 8th, 1967, and highlights the sale of a new 82-40 to Ham Crotty, another legend in earthmoving, of Mid Cornwall Contractors. ARC WAS A LARGE PART OF JBH SALES OVER THE YEARS, AND A GOOD PART OF HML`S REBUILD PROGRAMME FINISHED UP IN ARC WESTERN, UNDER THE AUSPICES OF GOOD CONTACTS FROM SHREWSBURY. Dear Editors, as discussed please find attached photos of 33-07 possibly an HML rebuild at what could be Llynclys circa 1984. As you will see Goodley has shoe-horned himself in on the act and is berating both John Brookes and Jim Cox from ARC Western. Hope this finds you well and congrats again on a super re-union. Cheers, Ned. WHAT MUST IT HAVE BEEN LIKE TO SELL A FLEET OF SIX NEW B10LOT`S !! EVEN IN 1978, IT MUST HAVE BEEN HEADING UPWARDS TOWARDS A MILLION POUNDS.....ANYWAY, HAL KELLY AND HIS WESTERN REGION CREW, WHICH I AM SURE MUST HAVE INCLUDED PETER GOODLEY, DID JUST THAT WITH JOHN JONES EXCAVATIONS OF MANCHESTER (?? ), AND HERE BELOW YOU CAN SEE HAL, MR JONES, GEORGE HEANEY AND ONE OTHER UNKNOWN POSING IN FRONT OF THE FLEET IN CUMBERNAULD, PRIOR TO DELIVERY. SOME IMAGES HERE FROM WESTERN REGION, SHOWING CUSTOMERS MACHINES FROM DIFFERENT ERA`S. ....and lastly, into the 1980`s, with a 33-11E being loaded by a 994 Liebherr, probably out near Telford. AT LAST WE HAVE GOT AROUND TO SORTING PETER GOODLEY`S CONTRIBUTION OUT, AND IT FOLLOWS BELOW, PLUS A SELECTION OF PHOTOS FROM THE WESTERN REGION, FROM 1978 UPTO THE LAST KNOCKINGS IN 1990. 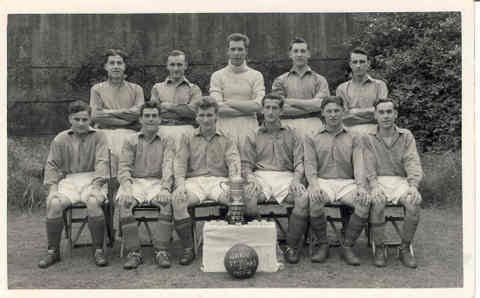 PETER`S RECOLLECTIONS FIRST, PHOTOS FOLLOWING..............BUT FIRST, WE COULD NOT RESIST SHOWING THE AUTHOR AS A YOUNG WHIPPER-SNAPPER IN HIS FOOTBALL TOGS IN 1953.......SO WHICH ONE IS HE ??????? 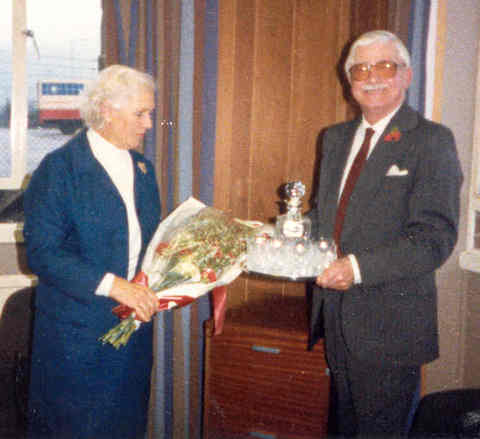 Recollections from Peter Goodley, Sales Manager from 1980 to 1991. Sales Teams before & during Peter`s time……..
Business was steady in the 1970`s, with little going to the coal industry. Opencast Coal was small beer compared to the Northern & Scottish Regions, then by the 1980`s, sales gradually got better, with inroads being made into some major companies, Tarmac, both Construction & Roadstone, McAlpine, ARC Western, Tilcon, N.C.B., Kingston Minerals & Short Bros. The beginning of the 1990`s turned out to be very special for Western Region because of the effort put into the job by everyone in the team. The sale of 6 units Terex 33-10E to E.C.C. in Cornwall for instance. David Magee had moved house to Somerset, and set the ball rolling with an enquiry from E.C.C. for 9 units of 60 ton trucks. A demo against the equivalent Caterpillar truck too place, with Martin Ede doing an excellent report showing the 33-10 the winner in every way. 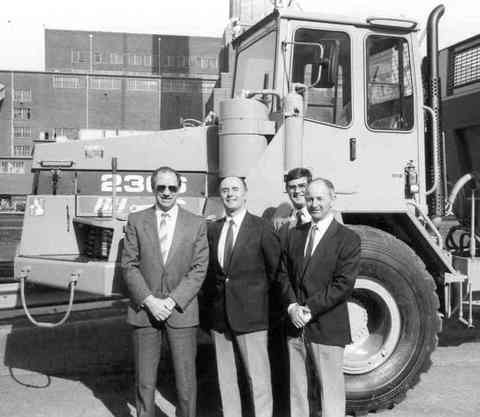 A visit to Terex at Newhouse by E.C.C. personnel was well organised by Ken Coughlan, plus a visit to see 33 Series trucks working in Derbyshire. The unfortunately timed closure of St Austell depot was negated by a visit by John Judson, with a promise to have a consignment stock on E.C.C.`s site. Team work at its best !! The artic truck demo went quite well, despite the “arctic” conditions. The “Lovely South “? 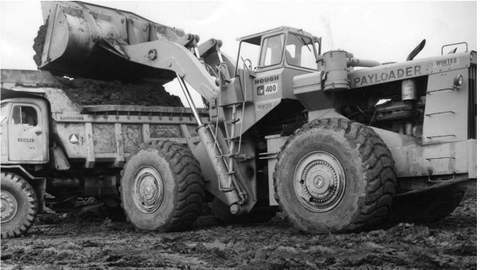 David Magee was also successful with a sale of 2 x Terex 33-05B dumptrucks, in what was to be eventually the last working colliery in South Wales, Tower, and also in the late 1980`s from Tarmac again, orders for the newly built model of the TS-24C motor scraper, the first units sold in the UK. This order followed more excellent teamwork, when Mike Henshaw, Terex Export Sales Manager, took myself and John Tull from Tarmac, to Fort Dodge (Des Moines), Iowa, USA, and thence onto a US Gypsum quarry with J. Bell, who was a service manage for the local Terex Dealer. There we met up with the quarry & plant managers from US Gypsum, and saw TS-24C`s stripping overburden. The visit was excellent, and went down well with John Tull, and was followed by another visit, this time to Amax Mining`s Chinook Mine. 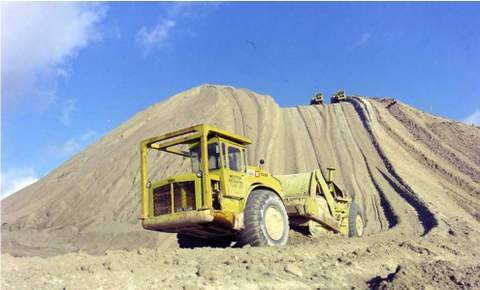 Amax were running 9 x TS-24C`s, both pushed by Cat & Komatsu dozers, and also with helpmates, self-loading. After another excellent site inspection, the next day we were given a full and detailed report of the running costs and reliability of the TS-24C`s, from Rich Johnson, the Amax manager. A report from their drivers also glowed with praise for the Terex over the Cat 631D, as it carried more (bigger bonuses), had better hydraulics and also was much the more comfortable machine to drive. Peabody Coal was the next call on the schedule, in Cumberland, Idaho, which was a really huge operation. 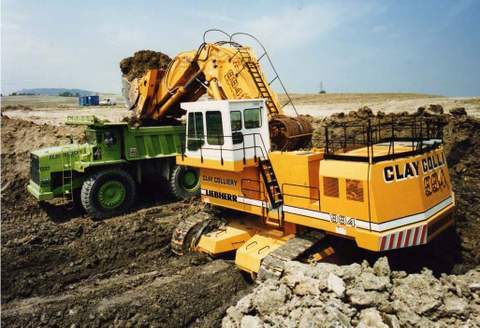 1.85M tons per month overburden removal, by many machines including a mixed fleet of 5 x TS-24B/C`s, the worlds largest excavator (at that time, Ed. ), a Bucyrus 4350, 3 x 150 ton rock trucks, and 5 x 150 ton coal haulers, etc, etc……a well worth stop on the schedule. Following this trip, Juhn Tull also came to Terex`s 3 day presentation, and an order for 2 new TS-24C`s was placed, brought about by teamwork yet again. John even won the sweep and drew the eventual Derby winning horse. After the Zettelmeyer agency was acquired, Tony Green, who covered quite a few Tarmac & Tilcon quarries, and the CEGB in his patch, made his name by selling the very first ZL5001F loading shovel with the self levelling suspension to ECC at Much Wenlock (ref AFM). Zettelmeyer had Robert Blazias on site for the demonstration, with Tony, Alan Matchett & Martin Ede, this being followed by a customer visit to the factory in Germany. At the demonstration, the QM from Much Wenlock drove the ZL5001F, and when he got out and drove off in his Land Rover, he stopped twice to check his tyres and suspension, such was the quality of the Zett, he thought he had a problem !! Tony sadly died before he could properly enjoy his retirement. Danny Lighfoot covered the north of Western Region, and was successful with the quarrying people in his area, Tarmac, Tilcon, and ARC, but also made a breakthrough with 6 of the new range of Terex articulated dumptrucks to George Noblett, in Cheshire. Danny was always hunting around, looking for new outlets, and an excellent member of our team. Fortunately still growing old disgracefully like the rest of us. 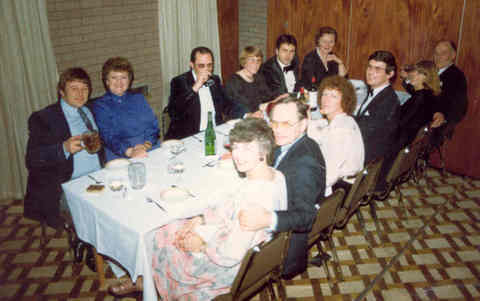 NOW SOME PHOTOS......1978/79 CHRISTMAS PARTY, PROBABLY AT BLACKWOOD, JUST NEAR THE M50/M5 JUNCTION.....THOSE PRESENT ARE.... FROM THE LEFT, FAR SIDE OF TABLE---- CAROLE LOWE & HUSBAND, PG, MARGARET MAGEE, KEITH BREALEY, ELFREDA MITCHELL.....AND FROM THE RIGHT, ON THE NEARSIDE OF TABLE....."THE DUKE", DEAR OLD GEORGE MITCHELL, ANN BREALEY, DAVID MAGEE, JEAN GOODLEY, AND JANET ? & HUSBAND. ......AND LASTLY, USKMOUTH POWER STATION, 1990, THE COMPLETE SALES TEAM, THE "FOUR MUSKETEERS"....PG, DANNY LIGHFOOT, DAVID MAGEE, AND TONY GREEN.